A scene of the University of Education, Winneba. The Council statement follows a stand-off between the students and the Vice-Chancellor, Rev. Fr. Professor Anthony Afful-Broni over the dismissal of three lecturers. The Stand-off which escalated into violent protests saw students smashing windows, glass doors of buildings, burning tyres and clashing with the police, Joy News’ Richard Kwadwo Nyarko has reported. In the ensuing melee, the Regional Security Council announced the closure of the university on Thursday. 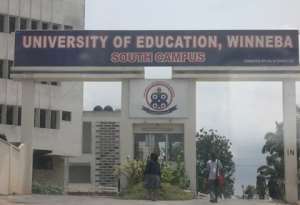 The University is committed to the directive of the Regional Minister, Chairman of REGSEC to close the Winneba and Ajumako campuses of the University until further notice. Early next week when Council shall meet, details of the way forward for the University will be communicated to the University Community and the General Public. We are by this release appealing to all to remain calm and to assure the nation that we shall do all in our power to restore calm and normalcy to campus as soon as possible.